owner does not live in house. rents out 5 spaces in house up to 3 people in each. using garage as room (likely unpermitted), curtain in living room for room. can be 12 people or more for 1 bathroom. people coming & going all hours of night. multiple cars. toilet paper in yard. drunks, marijuana. Pavement extremely worn - almost gone from some spots. Lots of cracks. “Rocks” broken off around manhole cover. Please contact the customer since the streetlight is city owned and not PG&E owned. It's getting better! They've come by and really filled in (not just topped off with gravel) many of the holes. But, two houses down, there is a manhole cover with a serious pothole around it. I'm happy that I can now get out of my driveway without popping a tire, but my neighbor is still in trouble. Every few months the city will come around and scatter gravel into the holes. It's not enough. The gravel just makes the road slippery, while it scatters across the whole road, the holes still very much there, grabbing your tires. access_issue: I just know it looks like a metal light pole. Do not know if it is mercury vapor, HP sodium vapor, or incandescent. We are submitting a request for a customer since this streetlight is city owned and not PG&E owned. Please contact the customer. They are still there. Have been since Friday. This still goes on. During the week they may be gone for a day or two but then they come back. 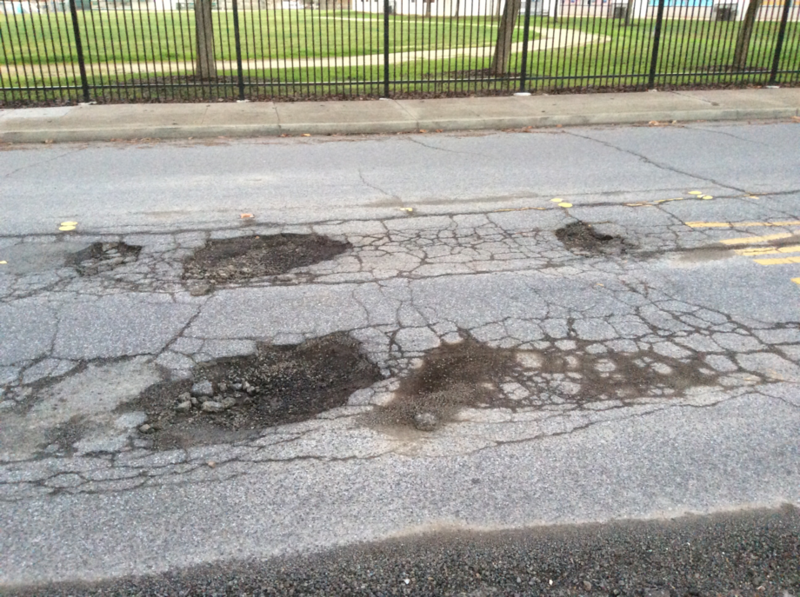 There is a large amount of pot holes on New Jersey Ave at the front of Price Middle School. This is some but not all of the potholes on New Jersey Ave on the middle school side of the Curtner Ave intersection. You should probably report this to the non-emergency number for the police. This site, which your city may or may not be paying any attention to, is more about maintenance problems, such as broken street lights. we have lights out since march 2015. it is very dark now in the court.